I recently posted in the NCECA Facebook group that I wanted to hear your NCECA questions and I would then answer them here on the blog. Already I have gotten great responses! In an email, I was asked about the Exhibitions and Bus Tours. Shows have become one of the biggest parts of NCECA attendance, so it’s going to take more than one blog post to cover this topic! Thanks for the great question, Sophia King!!! NCECA partners with Lew White Tours to provide Bus Tours for NCECA attendees. These tours represent join planning by NCECA’s on-site conference liaisons (in Providence – Jay Lacouture and Larry Bush) and Lew White himself. Our on-sites work with galleries, museums, arts centers and other locations that are hosting shows and then provide this information to Lew White, who puts the tours together. Tickets should be purchased in advance (this happens directly with Lew White, it is not part of your conference registration), or you can sometimes buy tickets on-site (subject to availability) at the Lew White booth near conference registration and voting kiosks. Bus TOURS leave at a set time, usually from the convention center (check the Lew White desk for details on where to meet your bus), go to a location and wait while tour participants view exhibitions and then re-board everyone onto the bus and travel to the next location. Essentially, on a bus TOUR, your bus stays with you the entire time. NCECA conference attendees often find the bus tours to be the best way to see a variety of exhibitions without having to navigate city transit or rent a car. They also represent a great way to meet other people and forge new friendships! For the Providence Conference, there are 3 bus tours available. Let’s first look at the…. Pouring Arts Invitational 2015, Peter Beasecker, Bede Clarke, Bruce Dehnert, Susan Filley, Julia Galloway, Nick Joerling, Doug Peltzman, Jane Shellenbarger, Linda Sikora, Sandy Simon, and others.. 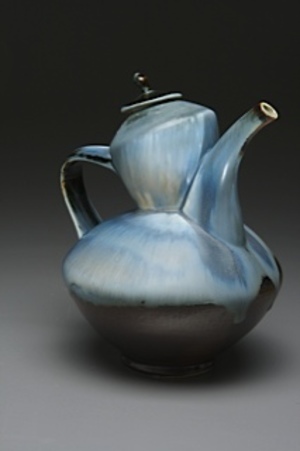 The Pouring vessel’s many guises- teapots, ewers, pitchers, creamers- inspired by the fluids they dispense, will be on view by 20 potters recognized for their ongoing exploration of these forms. Organized by Jim Lawton. Hours during NCECA: Wed 9am- 5pm; Thu-Sat 12-5pm. Reception: Wed, Mar 25, 10am-12pm. Feb 27-Mar 28. New Bedford Art Museum/ ArtWorks! Hours during NCECA: Wed 10am-5pm (free coffee 10-12); Thu 12pm- 9:30pm; Fri-Sun 12-5pm. Reception: Thu, Mar 25, 5-9:30pm. In Residence, Meredith Brickell, Jody Burr, Linda Casbon, Ayumi Horie, Kristen Kieffer, Kathy King, Linda Lopez, Firth MacMillan, Linda Sormin, Michaeline Walsh. Four AIA (Artist Invite Artists) leaders selected three artists from their session. Their diverse work, grouped by session, portrays the unexpected community and exploration that results during a two-week Watershed residency experience. Curated by Sarah Archer. Jan 21-Apr 2. Salad Days: Second Course, Jessica Brandl, Gratia Brown, Patrick Coughlin, Stuart Gair, Sean O’Connell, Meredith Host, Adam Paulek, Kari Radasch, Alyssa Welch. New interpretations of “repetition resulting in transformation” that Watershed’s juried Salad Days Resident Artists experienced in making the required 500+ plates for Watershed’s annual Salad Days event. Organized by Sean O’Connell. Jan 21-Apr 2. Staff Meeting, Dylan Beck, Ryan Blackwell, Birdie Boone, Lynn Duryea, David East, Wm Reeder Fahnestock, Tyler Gulden, Benjamin Lambert, Shawn O’Connor, Irene Saito, Karin Solberg. Celebrates the creativity, craftsmanship and commitment of 12 of Watershed’s talented and hard working past summer and year round staff. Curated by Sequoia Miller. Jan 21-Apr 2. Bind the Divide, Claudia Olds Goldie, Tim Ian Mitchell and Dan Molyneux. Three diverse artists connected by region and bound by transformative experiences during residencies at Watershed Center for the Ceramic Arts explore psychological, narrative, and architectural themes in new sculptural work. Curated by New Bedford Museum of Art/ArtWorks! Mar 4- Apr 2. Group Dynamic, Stephanie Rozene, John Oles, William and Rachel DePauw, John Gargano, John Donovan, Dana Chapman Tupa, Lisa Ehrich, Liz Bryant, Lauren Duffy, Shauna Cahill.. Recent work from artists who participated in a 2011 Artists Invite Artists session at the Watershed Center for Ceramic Arts exploring the influence of the communal experience of the their residency and the continuing dialog between a subset of those residents. Organized by John Oles. Mar 25-28. The Uncommon Object, Bogus/ Kendall, Burr/ Burr, Cunningham/ Molyneux, Grimmer/ Meyers, Grover/ Hicks, Katz/ Puryear, Marquis/ Swenbeck, Oles/ Carter, Wetherell/ Notkin, and Willers/ Isbister. 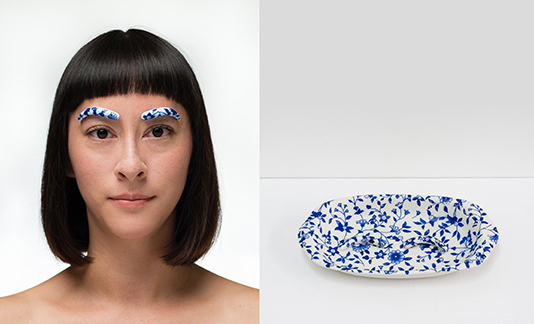 Alumnus from the UMass Dartmouth Ceramics Program invite artists who have been influential in a manner contrary to their aesthetic, finding pairings revealing an unusual logic, a connection in uncommon objects. Curated by Rebecca Hutchinson and Jim Lawton. University Art Gallery, Hours during NCECA: Mon-Sun 9am – 6pm; extended hours Thu until 9:30pm. Reception: Thu, Mar 26, 6-8pm. Feb 12-Mar 28. Bound(ary), Claudia Mastrobuono, Jodi Stevens, and Leslie Macklin. The notion of investigative boundary suggests both limits and frontier, the container and the contained, and the line between self and other. Through the perspective of three different artists mixing clay, fiber, found object, and patterning as sculptural. 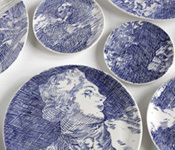 Curated by Rebecca Hutchinson. Crapo Gallery, Hours during NCECA: Mon-Sun 9am-6pm; extended hours Thu until 9:30pm. Reception: Thu, Mar 26, 6-8pm. Mar 1-28. Wild Love, Heather Jo Davis and others. Invitational Installations by UMassD alumni and current graduate student Heather Jo Davis, exploring connections to land and nature’s wild. Organized by Andrea Abarca Coutts and Rebecca Hutchinson. Hours during NCECA: Mon-Sat 8am-6pm; extended hours Thu until 9:30pm. Reception: Thu, Mar 26, 6-8pm. Mar 23-28. Love and Wonder, Jennifer Ling Datchuk and Ryan Takaba. “Nothing new here except my marrying, which to me is a matter of profound wonder.” – Abraham Lincoln, in an 1842 letter to Samuel Marshall. Sculptural and collaborative works by Jennifer Ling Datchuk and Ryan Takaba. Curated by Rebecca Hutchinson. Hours during NCECA: Mon-Sun 9am-6pm; Thu hours extended to 9:30pm. Reception: Thu, Mar 26, 6-8pm. Mar 22-28. Another Round! Ceramic students from UMass Dartmouth. The Ceramics Club at the University of Massachusetts Dartmouth present functional vessels inspired by the consumption of alcohol. Works include traditional implications of the beer stein and whiskey cups to the critique of alcohol consumption in the present day. Items will be for sale. Curated by Mary Black. Hours during NCECA: Sun 4pm-1am; Mon & Tue 11am-1am; Wed 10am-1am; Thu-Sat 11am-2am. Reception: Thu, Mar 26, 8-10pm. Mar 1-29. The Creative Complex, Carly Costello and Joe Lee. 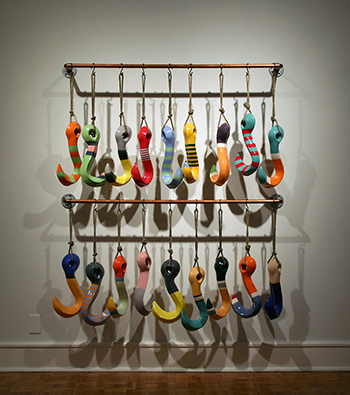 An exhibition of sculptural work by Carly Costello and Joe Lee, University of Massachusetts Dartmouth Post-Bac ceramic students. Work explores themes of complexity and the interactions within social structures. Organized by Carly Costello. Hours during NCECA: Mon- Tue 2-8pm; Wed 9am-5pm; Thu-Sat 2-8pm. Reception: Thu, Mar 26, 5:30-7:30pm. Mar 15-Apr 15. Pliable, Sara Allen, Brooke Armstrong, Mary Black, Kelly Daniels, Heather Jo Davis, Meaghan Gates, George Karos, James Mitschmeyer, Xi Nan, Andrew Stansbury, Hanna Vogel, and Amanda Watkins.. Recent works by the twelve graduate ceramics students at the University of Massachusetts Dartmouth. Organized by George Karos. Hours during NCECA: Sun 11am-3pm; Wed 9am-5pm; Thu-Fri 11am-5pm; Sat 11am-3pm; Thu hours extended to 9:30. Reception: Thu, Mar 26, 5-7pm. Mar 1-29. 6x6x6, Junior and Senior Undergraduate students at the University of Massachusetts. Small 6”x6”x6” works created by the ceramic students at the University of Massachusetts. Curated by Jim Lawton and Jessica Burley. Hours during NCECA: Tue 11am-5pm Wed 9am-5pm; Thu-Sat 11am-5pm; Thu hours extended to 9:30pm. Reception: Thu, Mar 25, 5-9:30pm. Mar 1-29. Of Earth + Sea: Contemporary Artists Respond to the New Bedford Whaling Museum Collection, Chris Archer, Mary Barringer, Cynthia Consentino, Molly Hatch, Sergei Isupov, Kathy King, Jim Lawton, Seth Rainville. Eight ceramic artists from New England respond to the encyclopedic collection of 19th c. artifacts at the New Bedford Whaling Museum, making objects and site specific projects throughout the museum. Curated by Christina Connett. Hours during NCECA: Sun 11am-4pm; Mon closed; Tue 9am-4pm; Wed 9am-5pm; Thu-Sat 9am-4pm; additional hours Thu 5-8. Reception: Thu, Mar 26 5:30-8pm. Mar 12-Aug 12. Gallery is accessible by a deck area that has steps. Kiln site, where other works will be shown, is handicap accessible. Friends of Fire: Contemporary Wood Fired Ceramics, Dan Anderson, John Balistreri, Barry Bartlett, Ashwini Bhat, Doug Casebeer, Jan McKeachie Johnston, Randy Johnston, Justin Lambert, Matt Long, Don Reitz, Arnie Zimmerman, and others. An invitational exhibition of works by the artists who are participating in the pre-conference anagama firing at Gustin Ceramics. Organized by Chris Gustin. Hours during NCECA: Wed-Sat 10am-5pm. Reception: Wed, Mar 25, 1-5pm. Mar 24-Apr 27. Chris Gustin exhibit fully accessible, secondary exhibit in upstairs gallery not accessible. Slow Breath: Recent Works by Chris Gustin, Chris Gustin. A solo exhibition of recent works by Chris Gustin. Curated by Isabel Mattia. Hours during NCECA: Wed-Sat 10am-5pm. Reception: Wed, Mar 25, 1-5pm; Sat Mar 28, 5-7pm. Mar 25-Apr 26.
single 3″ step up into the gallery. Hours during NCECA: Sun-Sat 12-9pm. Reception: Thu, Mar 26, 7-9pm. From Potash, Malcom Wright, Marina Lantin, Ellen Schön, Tom Hoadley, Megan Mitchell, Charlie Barmonde, Wilson Gaul. A survey of ceramics created by a selection of faculty and alumni from Marlboro. Mar 22-28. Mallory Wetherell and Matt Ziemke: Side by Side, Matt Ziemke and Mallory Wetherell. New and collaborative works of two artists who’ve worked side by side for six years. Detailed underglaze renderings on porcelain paired with industrially inspired objects and an urban color pallet. Mar 22-28. Reimagined Structure, David Katz. David Katz will present a site-specific installation of unfired clay that reimagines the potential of the oldest remaining farm building in the historic New England town of Tiverton, RI. Mar 22-28. Stay tuned to for details of the Newport & Boston Tours and info on Continuous Shuttles!